METROPOLITAN was created for the younger customer seeking a chic minimalist look for a limited budget. Most low cost bathroom ranges are dated and lack style and appeal, Metropolitan has a balanced mix of curves and straight lines resulting in a strong statement for today's smaller bathrooms. The 42cm basin sits on a wonderfully crafted half pedestal. Please Note - All taps & wastes pictured are for display purposes only, all taps and accessories are sold separately. 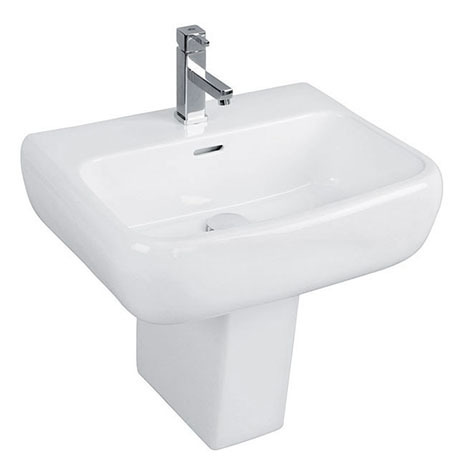 If like me you have a small bathroom this sink is perfect for not taking too much valuable space. As it's only 420mm deep it doesn't take much room and is perfect for brushing teeth or quick face wash. My semi pedestal came marked but they came off with elbow grease. Went for a clickclack plug that are notorious for leaks but my advice is to buy a vanity basin waste plug from bnq to stop this.All in all really please with Victorian plumbing shall use again and recommend!